Unions and Associations of BSNL are organising Protest Demonstrations throughout the country on 12.04.2019, against the implementation of VRS in BSNL. All the Circle Office Bearers / District Secretaries are requested to hold Protest Demonstrations against the arbitrary imposing of VRS in BSNL by making 100% participation of our members at Circle and District Levels. 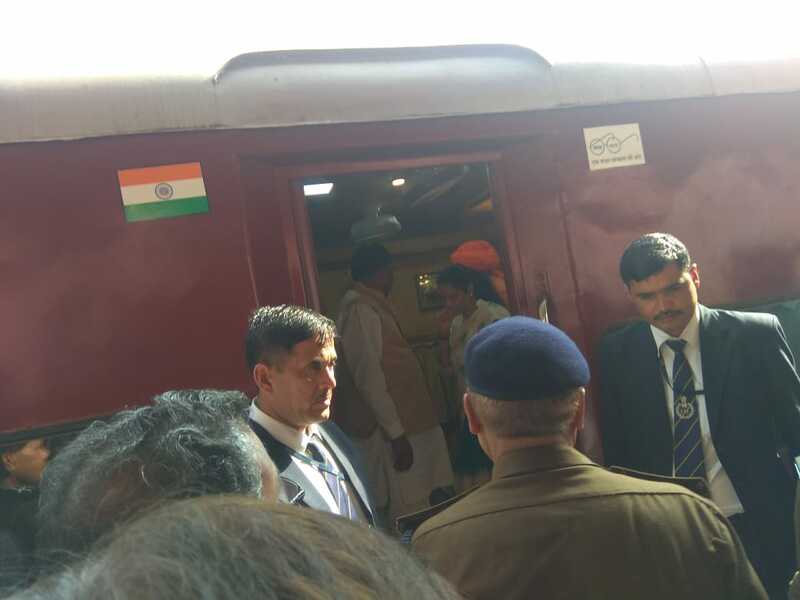 09.04.2019: Why AIBSNLEA is opposing VRS? You are aware that DoT, under the instructions of PMO, has suddenly decided to roll out VRS Plan for BSNL/MTNL employees. BSNL Management has been assured that there will be no dearth the money to give effect to VRS proposal. Almost 54000 existing employees of BSNL are supposed to go out the roll of the BSNL on implementation of this VRS. This is done under the pretext of �Revival of BSNL/MTNL�. You are also aware that all BSNL Unions and Associations barring a few, have decided collectively to oppose this move of the Government and AIBSNLEA is a party to this and accordingly Notice has been issued to the DoT/BSNL to hold protest demonstration on 12th April 2019. The question is why have we taken such decision? Does it mean, we as Associations and Unions of BSNL do not have any concern for revival of BSNL from the ongoing crisis? Or, is it that we are indifferent about the interests of the individual members? It is to everybody�s knowledge that the Unions and Associations of BSNL are very responsible Trade Union organizations and interest of BSNL is prime in their minds. For last couple of years the Unions and Associations have been constantly fighting for uplift of BSNL in the arena of cut throat competition. We have resisted every moves by the authority that be to inflict harm to BSNL directly or indirectly. Years before we have demanded to roll out 4G in BSNL to make it more competition fit. Other demands having financial implications e.g. payment of pension contribution on actual basic pay instead of maximum of pay scale have been demanded and pressed for by us. At the same time we have opposed the move of VRS even earlier. Why? Association is aware that there may be individual members who, out of their own unique situation or personal financial equation may feel that VRS is up to his or her interest. AIBSNLEA is sensitive to the interests of individual members. But we must understand that the issue like VRS at this crucial juncture cannot and should not be viewed through a narrow prism of individual gain or loss. We, the office-bearers at various level must try to weigh it on broader perspective. BSNL should stay healthy. There are employees who have long service life left. They should not be sacrificed for short term gain. Our Association is not opposed to VRS par se. We are aware that in PSU systems, VRS is an accepted proposition. We are also aware that in some organizations VRS is implemented to the advantage of the organizations and the employees have been benefited as well. It is a win win situation there. In these organizations where VRS is successfully implemented, the entire road map is carefully chalked out on long drawn perspective. VRS is planned 2-3 years before. The targeted employees are identified carefully, mapping the need of the field and the action for suitable replacement is initiated well in advance. So that there is no shortage of man power. The instant VRS proposal is brought in a hurry and it is apparent that actual purpose behind it is not the revival of BSNL but something else. Just considered the situation how and when such proposal is being hurriedly push through. A few weeks/months before unions and associations were demanding some important issues related to well-being of BSNL, even DOT / BSNL precipitated an agitation in BSNL . DOT and Ministry were not in a mood to consider any of such demand. Even at the instructions of the higher-ups payment of the salary of employees was stalled. Now when the entire country press into election mode and Model Code of Conduct is affected. Suddenly all this proposals were brought in the hasty move. BSNL Unions and Associations and other stake holders of BSNL have never been taken in to confidence or even consulted before taking such hasty decision. What is the reason? We are sure this may be anything other than in the interest of BSNL. By such move they want to harm BSNL and make it in a retrograde situation in the competitive scenario. Privatization may also be hidden agenda. On the contrary, consider the case of MTNL where VRS has been implemented twice so far. But the net result is that MTNL became weaker and weaker at this. Now when DOT is proposing VRS in MTNL for the third time to reduce 10000 employees, MTNL is having at present 22000 employees and already experiencing acute shortage of working hands in the field units. The revenue hits at the lowest bottom. The strength of employees has been reduced drastically but so is the customer base and revenue earning. None in DOT/Govt is interested to look at it. It is as if, reducing the employees is their ultimate objective and not revival of MTNL. One can easily understand what is going to happen in MTNL in coming few days. For BSNL, VRS is being thought of only from one angle. Let the strength of the employees be reduced so that present wage bill is reduced. But there is no consideration about the resultant impact in the field units. We are certain that minimizing the working hands by applying mindless VRS without having any regard to its immediate retrograde impact in the field, cannot serve any meaningful purpose in the way of reviving of BSNL. It will go in MTNL way. One VRS will follow another VRS but crisis will continue. Unmindful reduction of staff will lead to a situation where offloading of day to day maintenance work will be assigned to the petty contractors. Cost will be enhanced but efficiency will be reduced resulting into steady loss of customers and revenue. We cannot have opportunistic approach on such a vital issue which will affect the BSNL and its employees. As per the call of the AUAB, thousands of Executives and Non-Executives participated in the Massive Rally to Sanchar Bhawan held today. Large number of AIBSNLEA members from all over India participated in the said Rally. The rally started from Eastern Court, BSNL CO, New Delhi at 11:45 hrs and the same was converted to huge meeting at Jantar Mantar. Com. Chandeshwar Singh, Chairman, AUAB, presided over the meeting. The meeting was addressed by Com.Tapan Sen, General Secretary, CITU, Com. Kango, Vice President, CITU. Com. P. Abhimanyu, GS, BSNLEU & Convenor, AUAB, Com. Prahlad Rai, GS, AIBSNLEA, Com. K. Sebastin, GS, SNEA , Com. Suresh Kumar, GS, BSNL MS and Com. Rasheed Khan, AGS, TEPU. We heartily thanked to all the comrades who participated in this rally from the nooks and corners of the country, to demand the implementation of the charter of demands of the AUAB. (a) Meeting with PMO on Revival of BSNL/MTNL: We enquired about the outcome of the meeting With PMO yesterday on revival of BSNL/MTNL. CMD confirmed that a presentation on BSNL Revival plan was made to PMO by him and mentioned that PMO is seriously working for revival of BSNL he confirmed that 4G spectrum will be allocated to BSNL shortly, Monetization of BSNL's non-core land may be decided by DoT and VRS to BSNL employees from the age of 50 onwards will be offered. Regarding HR issues of BSNL employees are under consideration in DOT only these issues were not taken up in PMO meeting. (b) Letter of Comfort on Bank Loan: On Letter of Comfort given by DOT to BSNL Banks have raised certain queries from DoT which has been sent to DoT to clarify, so that Banks can grant loan to BSNL. (c) DE to DGM Promotion: We requested CMD BSNL to consider DE to DGM(Engg.) promotions to fill-up 891 vacant DGM posts since CPC has been completed 3 months before and the VCRs are expiring in the first week of April-2019.CMD mentioned that CPC work is in progress and Pers. cell is making efforts to issue promotion order shortly . 02.04.2019: Today PMO hold the meeting on Revival of BSNL/MTNL: It is reliably learnt that the PMO today hold the meeting on revival of BSNL/MTNL. The Meeting was chaired by the Principal Secretary to the Hon'ble Prime Minster. Secretary (T) along with some Senior Officers of DoT and CMD BSNL/MTNL attended the meeting. On revival of BSNL Plan, CMD BSNL gave the Presentation wherein DoT has been asked to submit the Note based on the discussions and decisions taken in the meeting at the earliest. It is understood that PMO has assured to allocate 4G Spectrum to BSNL immediately, Monetization of BSNL's non-core land may be decided by DoT and VRS to BSNL employees will be applicable from the age of 50 onwards instead of 56 years age (About 1,10,000 BSNL employees comes under the age of 50+). DoT/BSNL will submit the final draft on the basis of the discussions and decisions to PMO shortly. PMO also clarified that BSNL should exist and immediately no disinvestment is proposed. Reduction of age from 60 years to 58 years is ruled out by PMO at present. It is also understood that the HR issues of BSNL employees concerning to Pay Revision and Pension Revision were not discussed in the meeting. 02.04.2019: Today Hon'ble Supreme Court of India pronounced the Judgement on Civil Appeal No.14967 of 2017 Vinod Verma V/s Union Of India & ORS: Wherein two - Judge bench of Hon'ble Supreme Court hold that the present appeal deserves to be dismissed in view of the judgment of this Court dated 12.08.2014 Transferred Case (Civil) No. ..... of 2014(arising out of T.P. (C)No.184 of 2013)(Rajesh Banta & Ors. vs. Dewan Chand & Ors.) and judgment of the three-Judge Bench of this Court in BSNL & ors. vs. S.K. Dubey & Ors. decided on 12.08.2014. The appeal is, accordingly, dismissed. It is reliably learnt that PMO is holding meeting on revival of BSNL / MTNL on 02.04.2019. In the revival of BSNL Plan, the 4G Spectrum allocation to BSNL, Pay revision of BSNL employees, Pension revision of BSNL retires, Payment of pension contribution on actual basic pay and monetization of BSNL's non-core land etc. may be discussed. Alongwith other Circles mainly surrounding Circles i.e. Haryana, Punjab, UP(West), Rajasthan & ALTTC Ghaziabad of the constituents of the AUAB are requested to take urgent steps for mobilising maximum number of executives and non-executives for participation in the Massive March to the Sanchar Bhawan, to be held on 05.04.2019. All the nearby District Secretaries are requested to participate with huge gathering in the Massive March to Sanchar Bhawan on 05.04.2019 to make it grand success. 18.03.2019: Meeting with Shri O.P.Gupta, CGMT Rajasthan: Genl. Secy., Com. Prahlad Rai; Circle Secretary, Com. M.K.Morodia and Circle President Com. Anil Rawat met Shri O.P.Gupta, CGMT Rajasthan on 18.03.2019 as curtsey and discussed some alerting issues related Rajasthan. 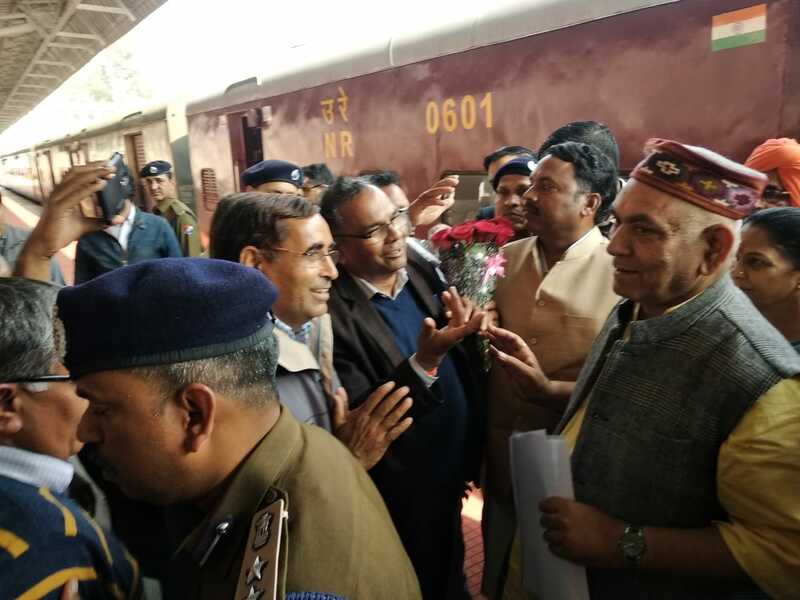 Shri O.P.Gupta appreciated the coordination of AIBSNLEA with management. 18.03.2019: Meeting with Shri G.P.Verma, Sr.GM(F) Rajasthan: Genl. Secy., Com. Prahlad Rai; Circle Secretary, Com. M.K.Morodia and Circle President Com. Anil Rawat met Shri G.P.Verma, Sr.GM(F) Rajasthan on 18.03.2019 and discussed some transfer issues. Shri G.P.Verma assured for favourable consideration of all the discussed issues. The Gen.Secy., Regarding: Representation of Shri Mohan Singh Sujawat, AO, Udaipur-TD, HR No. 198401723; regarding Cancellation of his Transfer Order to J&K circle. The CGMT Raj., Regarding: Request of Shri Ganpat, JTO, Jodhpur-TD, HR No. 200700257; regarding own cost & request deputation to RTTC Jaipur. The Gen.Secy., Regarding: Request of Shri J.P.Prajapat, CAO, Retired, HR No. 197506588; regarding relaxation in 2 weeks mandatory Training for IDA up gradation in E-5 scale of pay. 15.03.2019: Meeting with Shri O.P.Gupta, CGMT Rajasthan: Circle Secretary, Com. M.K.Morodia met Shri O.P.Gupta, CGMT Rajasthan on 15.03.2019 and discussed consideration of request transfers with minimal company cost transfers and other alerting issues. Shri O.P.Gupta assured for favourable consideration on all the discussed issues. The host circle Andhra Pradesh has requested CHQ for the postponement of 6th AIC of AIBSNLEA proposed to conduct on 9th to 11th April 2019 at Vijayawada due to General elections notified and elections scheduled for AP state on 11th April 2019. The general elections for parliament and some states throughout India notified schedule of elections from 11th April to 17th May 2019.As per CHQ notification the 6th AIC was notified from 9th to 11th of April 2019 at Vijayawada and the parliament and assembly elections for AP state scheduled on 11th April 2019. As per election code strict rules are being imposed and there will be 144 section for 72 hours before elections on 11th April 2019. The vehicles and hotels and the persons suspicious are under check is already started. Big gatherings and meetings are not permitted as per election code. In these circumstances it is very difficult to organize the 6th AIC which requires several delegates to participate in the Programme, Both assembly and parliament elections were scheduled for AP state on 11th April itself. We have thoroughly discussed with our AP Circle Office bearers and decided to request CHQ to postpone the proposed 6th AIC at Vijayawada. We are ready to organize the 6th AIC at Vijayawada as per the new schedule of dates. We have approached corporation authorities and they confirmed that they will allot the AC auditorium for 3 days from 14th to 16th of July 2019. For conducting 6th AIC at Vijayawada. In view of the above, AIBSNLEA CHQ has issued notice of postponement of 6th AIC on 14th,15th &16th July 2019 and Pre- AIC CWC meeting on 13th July 2019. PGM(Pers. ), BSNL Corporate office regarding Request for transfer / posting / cancellation / retention in the cadre of SDE. 14.03.2019: The latest Programme of action to be organised by AUAB to protest the anti-BSNL steps, being taken by the government, especially the DoT. It was decided by AUAB that a strong programme of action should be organised to protest the anti-BSNL steps, being taken by the government, especially the DoT, which has created the present crisis of BSNL. The CGMT Raj., Regarding: Request of Shri Daulat Ram, SDE-OL, Kota-TD, HR No. 200102188; regarding own cost & request transfer to Jaipur from Kota SSA. All Unions & Associations of BSNL in Rajasthan Circle had massive lunch hours Demonstration on 01.03.2019 protesting non payment of Salary of Feb-19 month. We thank all the members of AIBSNLEA of Rajasthan Circle on The Successful implementation of the call. It is very unfortunate that payment of salaries of the Executives and Non-Executives of BSNL, for the month of February, 2019, is not made today. All of us are aware that BSNL is not getting the permission of the DoT, for taking bank loans. The AUAB has already demanded that the DoT should immediately permit BSNL for taking bank loans, to tide over the crisis. However, so far, the DoT has not given the necessary approval. The AUAB has called on the employees to organise demonstrations tomorrow the 01.03.2019, protesting the non-payment of salary, and demanding the DoT, to immediately grant sanction to BSNL, for taking bank loans. All the members of AIBSNLEA are requested to participate actively in the said demonstration. 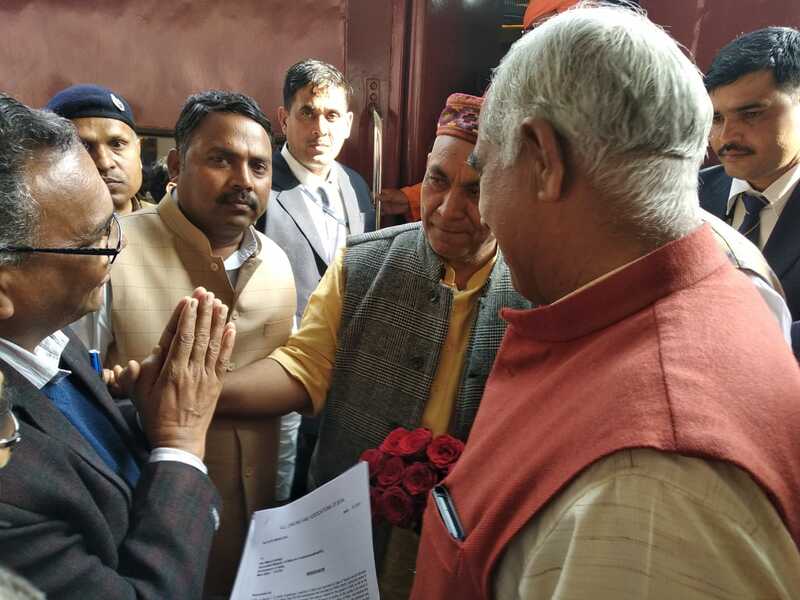 21.02.2019: 3rd PRC: AUAB Leaders met Hon'ble MOSC(I/C) Shri Manoj Sinha at Jhunjhunu during his visit on dated 21.02.2019 at 15 Hrs. Com. GS AIBSNLEA Sh. Prahlad Rai along with Com. CS AIBSNLEA Rajasthan Circle Sh. M. K. Morodia, Com. Advisor (North), AIBSNLEA CHQ Sh. Karan Singh & other office bearers of AUAB Jhunjhunu Rajasthan Circle met Shri Manoj Sinha, Hon'ble MoSC(I/C) on 21.02.2019 at 15 Hrs. AUAB leaders greeted & presented bouquet to Hon'ble MoSC(I/C) and submitted a memorandum. Com. GS AIBSNLEA on behalf of AUAB requested Hon'ble MoSC(I/C) to consider the demands of AUAB for settlement as assured earlier. Com. GS mentioned that revival of BSNL is in the interest of nation & also related to 20 Lakhs family members of BSNL employees & BSNL pensioners. Hon'ble MoSC(I/C) was quite responsive & positive to the AUAB leaders & assured for his kind intervention & advised to work more for the growth of BSNL. AUAB leaders assured him the best efforts for revival of BSNL. Regarding pay revision, pension revision & revival of BSNL, Hon'ble MoSC(I/C) further assured for positive action. All Unions & Associations of BSNL in Rajasthan Circle observed tremendous First Day General Strike on 20.02.2019 demanding implementation of 3rd PRC report and other demands as per the charter. We thank all the members of AIBSNLEA of Rajasthan Circle on The Successful implementation of the Strike. All Unions & Associations of BSNL in Rajasthan Circle observed tremendous First Day General Strike on 19.02.2019 demanding implementation of 3rd PRC report and other demands as per the charter. All Unions & Associations of BSNL in Rajasthan Circle observed tremendous First Day General Strike on 18.02.2019 demanding implementation of 3rd PRC report and other demands as per the charter. District Conference of Sawaimadhopur Branch held on 12th February, 2019, BSNL office Compound in descent manner. The conference was attended & addressed by Com.Pursottam Meena, ACS(C/E/Arch) and Com.Rajesh Pathak Advisor-I Rajasthan Circle. Election of set of office bearers were also held on the occasion of Branch conference. Shri K.K.Jain, CAO; Shri K.P.Meena, SDE and Shri Pawan Mittal, AO were elected as District President, District Secretary and District Financial Secretary respectively. AUAB rejects the proposal of the Management for deferring the salary for the month of February, 2019 - AUAB also rejects the appeal of the Management to withdraw the strike. A meeting between the AUAB and the BSNL Management was held today at 17:30 hrs. Shri Anupam Shrivastava, CMD BSNL, Ms.Sujata T.Ray, Director (HR & Finance) and Shri A.M.Gupta, GM (SR), were present. From the AUAB, Com.P.Abhimanyu, Convenor, Com.Chandeshwar Singh, Chairman, Com.Prahlad Rai, GS, AIBSNLEA, Com. K.Sebastin, GS, SNEA, Com.Pathak, AGS, AIGETOA, Com.Suresh Kumar, GS, BSNL MS, Com.H.P.Singh, Dy.GS, BSNLOA and Com.S.Sivakumar, President, AIBSNLEA, participated. The CMD BSNL explained the serious financial crisis being faced by the BSNL and appealed for the cooperation of the AUAB, for deferring payment of the salary for the month of February, 2019. The AUAB representatives firmly rejected the request of the CMD BSNL. They told in one voice that payment of salary of the employees should not be deferred. Thereafter, the CMD BSNL said that the 3 day strike, called on by the AUAB from 18.02.2019 will be self-defeating, and appealed to call off the strike. The representatives of the AUAB rejected the appeal of the CMD BSNL and reaffirmed that the strike will take place at any cost. They told the Management that the repeated assurances given by the Hon'ble Minister of State for Communications on 24.02.2018 and 03.12.2018 for the settlement of AUAB demands i.e. Implementation of 3rd Pay Revision with 15% fitment. Allotment of 4G spectrum to BSNL, as per the proposals submitted by the BSNL Management. Implement assurance of the Hon'ble Minister of State for Communications for de-linking pension revision from pay revision. Revise pension of BSNL retirees w.e.f. 01.01.2017. Payment of pension contribution by BSNL as per the government rule. Settlement of the left out issues of the 2nd Pay Revision Committee. (a) Approval for BSNL's Land Management Policy without any delay. (b) Expeditiously complete the mutation and the process of transferring of all assets to BSNL, as per the Cabinet decision taken on the eve of the formation of BSNL. (a) Ensure financial viability of BSNL, as per the decision taken by the Group of Ministers, at the time of formation of BSNL. (b) Issue letter of comfort for BSNL's proposals for taking bank loans. (c) Expeditiously fill up all vacant post of BSNL Board of Directors. Scrap BSNL's outsourcing for the operation and maintenance of it's mobile towers. ........are not implemented by the DoT. The AUAB also told the CMD BSNL that, plenty of time is already given to the DoT, and that the strike will now take place successfully. The AUAB told the Management in categorical term that, there is no question of going back from the decision to go on strike. All the District Secretaries are requested to make full preparations for the successful implementation of three days strike. AUAB held several round of discussions with DoT officers in the presence of CMD BSNL & Director(HR), BSNL Board but not even a single demand is resolved by DoT. It has forced AUAB to go on three days strike from 18th Feb., 2019 to 20th Feb., 2019. Implement assurance of the Hon'ble Minister of State for Communications for delinking pension revision from pay revision. Revise pension of BSNL retirees w.e.f. 01.01.2017. 31.01.2019: Update on 3rd PRC: AUAB meeting with Additional Secretary (T), DOT and its internal meeting tomorrow: In continuation to the discussion that the AUAB had with the Additional Secretary (Telecom) yesterday, further discussions took place between the AUAB and the CMD BSNL yesterday, as well as today. The representatives of the AUAB met Shri Anshu Prakash, Additional Secretary (Telecom) today afternoon. To their surprise, the Additional Secretary (Telecom) told the AUAB representatives today that, even giving the 5% fitment would be difficult. The AUAB did not accept the 5% fitment offer made yesterday. In this backdrop, the AUAB will be holding it's meeting at 11:30 am tomorrow. The meeting will take appropriate decision on the charter of demands. The Executives and Non-Executives are requested to keep ready for struggle. A meeting was held today between the AUAB and Shri Anshu Prakash, Additional Secretary(Telecom). AUAB representatives in the Committee for Periodic Interaction, Com.P.Abhimanyu, GS, BSNLEU & Convenor, AUAB, Com.Chandeshwar Singh, CS, NFTE & Chairman, AUAB, Com.Prahlad Rai, GS, AIBSNLEA, and Com.K.Sebastin, GS, SNEA participated. From the DoT side, Shri R.K. Khandelwal, Joint Secretary(Admn.) Shri S.K. Jain, DDG (Estt. ), Shri Rajeev Kumar, DDG (Budget), also participated. Ms. Sujata T. Ray, Director (HR) and Shri A.M. Gupta, GM(SR), represented BSNL. Detailed discussion took place on the 3rd Pay Revision, 4G spectrum, Payment of Pension Contribution on actual basic pay and Pension Revision issues. As regards the 3rd Pay Revision issue, it was suggested from the DoT side that, Pay Revision with 5% fitment could be given. If the AUAB accepted this, then this issue would be placed for the approval of the Digital Commission meeting, to be held on 05/02/2019, and that thereafter it would go for the approval of the Cabinet, said the DoT side. The AUAB stated that 5% fitment is very low and that they could not accept it. Thereafter, the AST suggested that the AUAB representatives could discuss the issue with the CMD BSNL and could come back to him within a day or two. Regarding 4G spectrum allocation to BSNL, AST mentioned that the queries made by DoE & Niti Aayog have been replied by BSNL and on that basis the matter will be discussed in the Digital Commission Meeting which is scheduled to be held on 5th Feb., 2019, along with 4G spectrum allocation proposal, the revival plan of BSNL including monetization of BSNL non-core land will also be discussed. After approval of Digital Commission, it will be taken up in the Cabinet for approval. Replies received from BSNL for the payment of pension contribution on actual basic pay will be send to DoE after the clearance of Internal Finance of DoT. The issue of pension revision, delinking from pay revision, AUAB representatives demanded 15% fitment since the pension contribution has already been paid to DoT by BSNL. Regarding anomaly on pension revision for the BSNL pensioners retiring after 01/01/2017, AST directed DDG(Estt.) to have separate discussion with the leaders of AUAB to prepare the formula for pension revision. Accordingly AUAB leaders had separate discussion with DDG(Estt.) on pension revision & decided to submit the formula for pension revision of post retiring 01/01/2017 BSNL pensioners shortly. PESB in its meeting held at 10.00 AM on 29.01.2019 [Today] recommended the name of Sh. 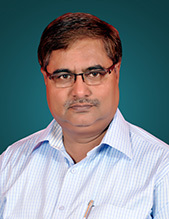 Pravin Kumar Purwar, CMD MTNT for the post of CMD BSNL. We congratulated Sh. Pravin Kumar Purwar for his selection as CMD BSNL. 28.01.2019: Meeting with Shri O.P.Gupta, CGMT Rajasthan: Circle Secy., Com. M.K.Morodia and Circle president Com.A.K.Rawat met Shri O.P.Gupta, CGMT Rajasthan on 28.01.2019 and discussed some alerting issues. Shri O.P.Gupta assured for favourable settlement of all pending issues. Considering various ground realities, the meeting decided to call on all the Executives and Non-Executives of BSNL to go on a three day strike from 18.02.2019. Street corner meetings are to be organised throughout the country for 5 days from 11.02.2019, and mobilise the support of the general public for the strike demands. Press meetings are to be organised at circle and district levels on 12 or 13 February. To meet all political parties for mobilising their support for the demands especially, the revival of BSNL. Revision of pension to BSNL retirees w.e.f. 01.01.2017. Extend financial support to BSNL, to ensure financial viability, as per the decision taken by the Group of Ministers, at the time of formation of BSNL. Issue letter of comfort for BSNL's proposals for taking bank loans. Director(HR), BSNL Board informed that Addl. Secretary(T), DoT has fixed up the Committee Meeting to discuss the demands of AUAB on 30th Jan., 2019 at 12.00 Hrs. Against the indifferent attitude of Sr.GM(FP) towards finance wing executives. AIBSNLEA strongly protested on 19th Nov., 2018 outside Sr.GM(FP) Office (Details also given below). Sr.GM(FP) was intentionally delaying issuance of AO to CAO Promotion on one pretext or the other. AIBSNLEA brought the kind intervention of CMD BSNL & Director(HR), BSNL Board in this regard, therefore only the AO to CAO promotion orders were issued on 20th Nov., 2018. Thus AIBSNLEA strongly demanded immediate HR integration wherein DGM(SEA) should report to GM(Pers.). Finally, the competent authority order for HR Integration on dated 24.01.2019. The CGMT Raj., Regarding: Representation of Shri Kamlesh Kumar Meena, SDE, Sawaimadhopur-TD, HR No. 200300540; regarding cancellation of his transfer order to Nagaur SSA on the ground of facts ignored by local management. 11.01.2019: BSNL CO JP Order: Supply of Diaries for year 2019 has been restored on consistent efforts made by AIBSNLEA Rajasthan. 10.01.2019: Meeting with Shri G.P.Verma, Sr.GM(F) Rajasthan: Circle Secy., Com. M.K.Morodia; Circle president Com.A.K.Rawat and Fin. Secy. Com.S.P.Gupta met Shri G.P.Verma, Sr.GM(F) Rajasthan on 10.01.2019 and discussed pending grievances of AIBSNLEA members. Shri G.P.Verma assured for favourable settlement of all pending issues. 10.01.2019: IIMA Report: The interim report of IIMA on Revival/Restructuring of BSNL. 09.01.2019: AUAB meeting with Secretary (T): On behalf of AUAB GS, AIBSNLEA , GS, SNEA, GS, BSNLEU & GS, NFTE BSNL met Secretary(T) in the presence of Additional Secretary(T) and discussed regarding formation of Institutional Mechanism Committee as per the directive of the Hon'ble MOSC(I/C) for interaction between the DOT, AUAB and BSNL. We requested the Institutional Mechanism should be headed at least by the Additional Secretary (T) and the AUAB should be given four representatives in the Institutional Mechanism Committee, two for the Executives and two for the Non Executives. On our pleading Secretary (T) allowed four representatives of AUAB as requested in the Committee. She mentioned that JS (Admin) is the Convenor of the Committee and after the meeting the members may meet with the AST/Secretary (T). AST confirmed that tomorrow at 1600 hrs. Institutional Mechanism Committee meeting has been decided to discuss the AUAB demands as a follow up action. Secretary(T) also mentioned that already Policy guidelines has been given by the Hon'ble MOSC(I/C) for the settlement of AUAB demands, the Committee has been constituted to monitor and keep the issues on track for settlement. She further assured that we can meet Secretary (T) also as and when required. The Sr.GM(F), BSNL Rj., Regarding: Request of Shri Lokesh Saini, JAO, Under transfer, Staff No. 60150160; regarding change of posting station to Jaipur instead of Kota.